We are now looking for someone to join the team at Haddo. The position is primarily for weekends (Saturday and Sunday), on a year-round basis. There will also be the opportunity for extra hours through the week during school holidays, so flexibility in working pattern is essential. Ideally, applicants will have previous coffee machine/cafe experience. If you are interested, please contact me. 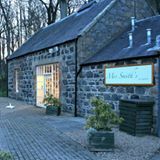 Mrs Smith’s at Haddo is located in the picturesque Haddo country park, Tarves. Offering takeaway Coffee, Tea and a fine selection of cakes. Hi. I am interested in the current vacancy in the shop. Unfortunately I have no coffee shop experience but I am a quick learner.